La Puerta de la Victoria was chosen as the first gate to be realised from the initiative, as a symbol of hope following the country’s conflicts throughout the 20th century. 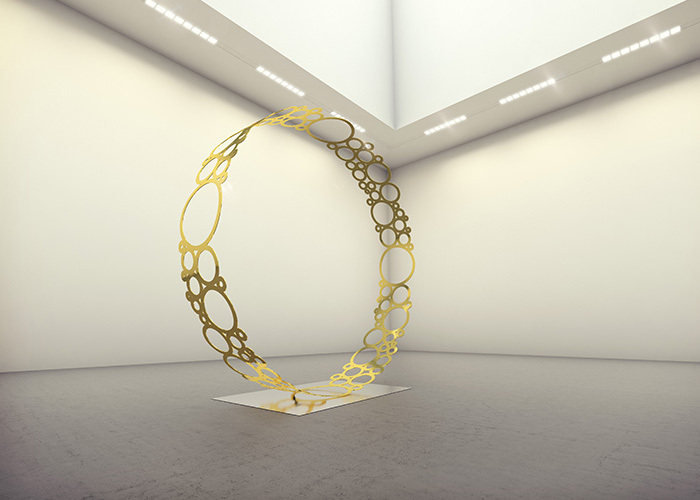 The monumental sculpture, in the form of several large circles, joint together, symbolize the union of community. 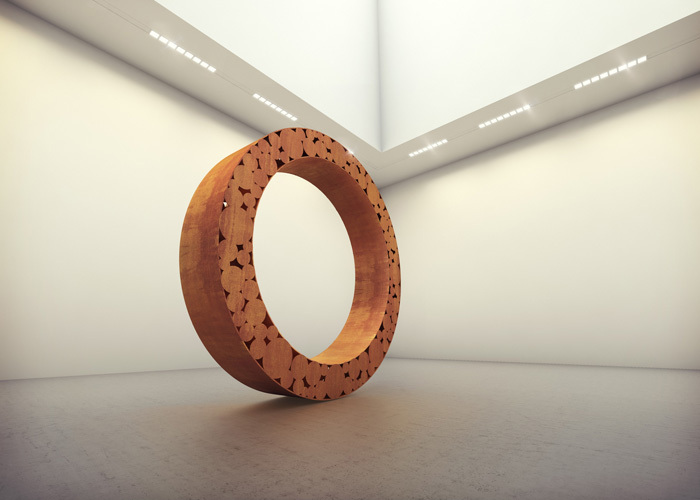 The structure itself is 4 meters diameter and manufactured using weathered Corten steel to give a rust-like finish. As if it were a pre-Colombian artefact found in the earth and elevated in the air, it pays homage to the country’s past, present and future. Installation began in February 2019 and the inauguration will take place on March the 2nd at 10am, at the Escuela de Equitación in Bogota, and will remain there permanently. Situated amidst a wide boulevard, it is an ideal location for all to see. 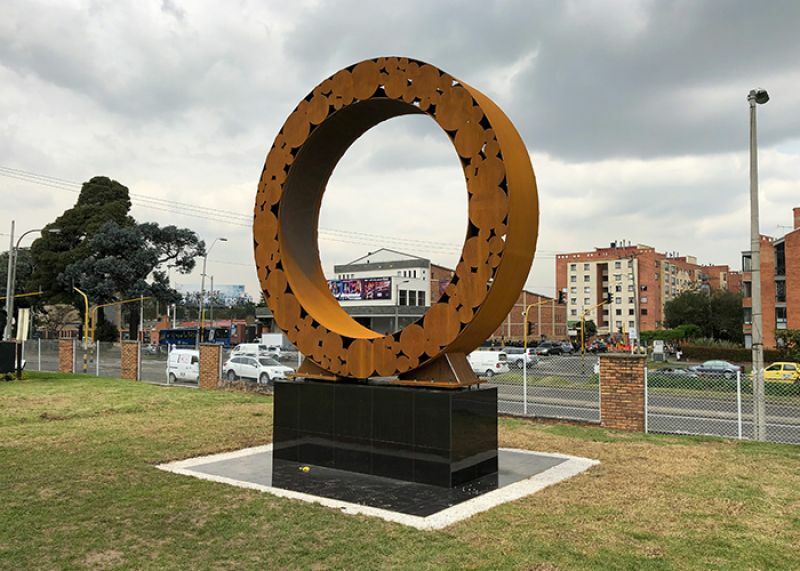 This urban art sculpture will become a landmark in the city, as it captures Bogota’s scenery from various angles; the sun, the Andes mountains, the sky, nature and the cityscape. To give the perception of it floating, it is elevated 1.5 meters off the ground on a concrete base. 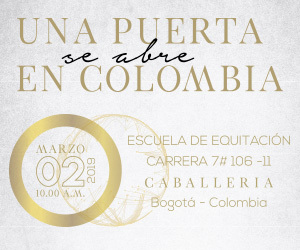 La Puerta de la Victoria is a reflection of Colombian roots, working together towards a prosperous future. Following the success of La Puerta de la Victoria monument and the generous support of our partners and sponsors, we have the pleasure of presenting a second gate. 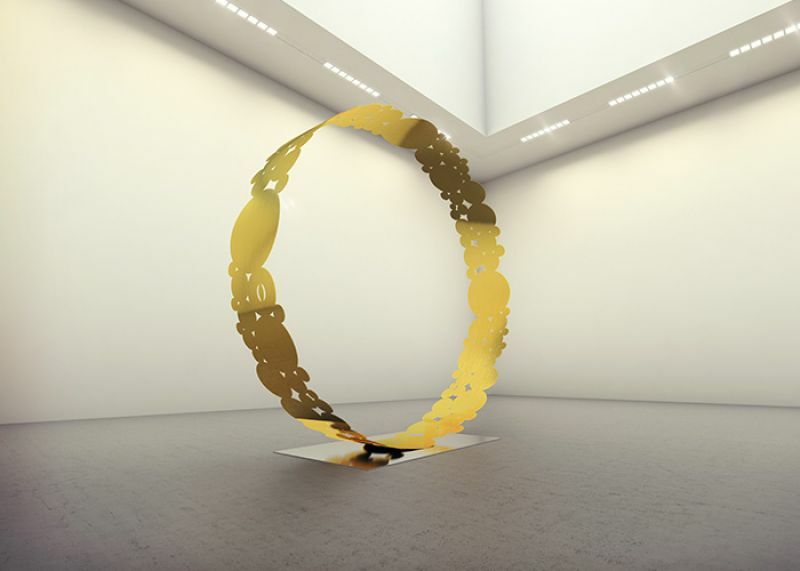 This temporary installment, named La Puerta de Oro (the golden gate), is exclusive to the Grand Hyatt Bogota and will be positioned in the hotel’s lobby. 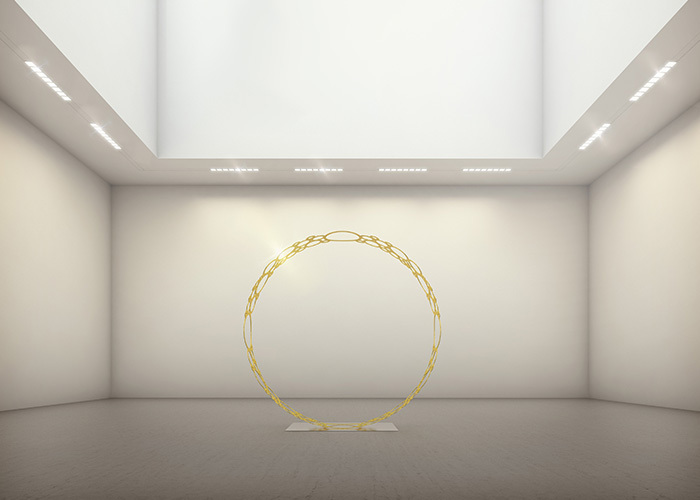 A replica of the Gate of Colombia (Puerta de la Victoria) in terms of shape, yet slightly smaller in diameter, the delicately designed ring was inspired by a gold nugget. 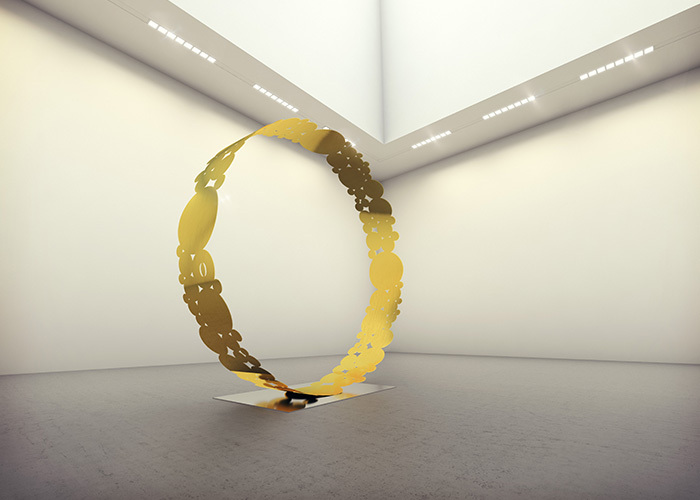 Obrenovitch realized a futuristic, abstract design based on his research of the country’s history of gold and its ancient artefacts. 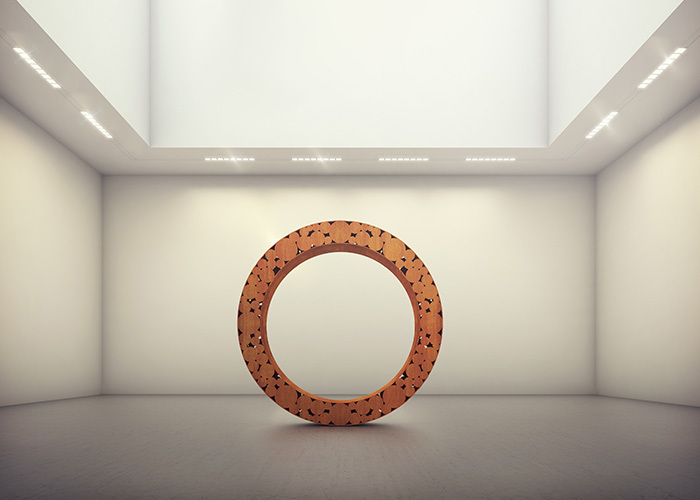 The fine base is made from stainless steel, the miroring gives an alternative perspective and a reflection to the artwork.